If you’re looking for inspiration for a new office kitchen, we’ve cooked up a list of some of our favourites. The office kitchen is more than just a place to make a cup of tea; It’s a space to take a break, catch up with colleagues or even have a meeting. Just as open plan kitchen and living spaces have become popular in our homes, office kitchens are integral part of the workspace. So, if you’re looking for inspiration for a new office kitchen, we’ve cooked up a list of some of our favourites. 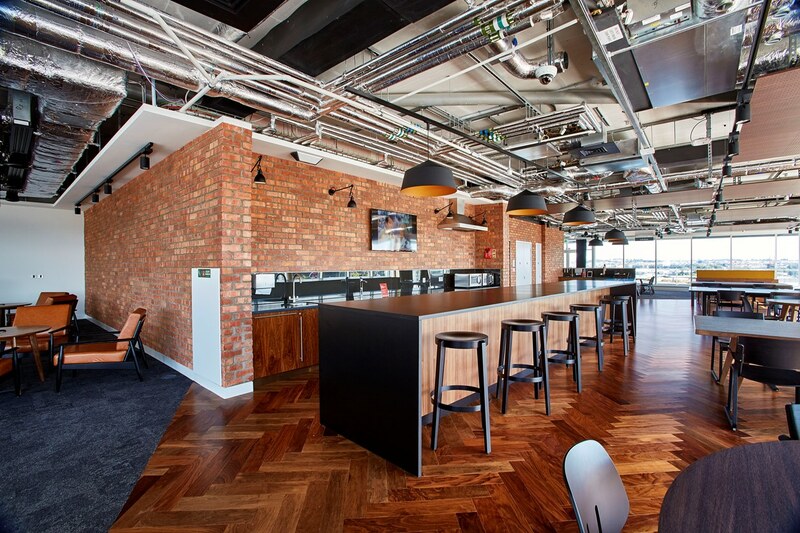 At PwC in Bristol this loft-style kitchen and breakout space truly reflects their strategy to create an energising workspace people are proud to work in. Exposed brickwork and services, along with parquet flooring, provide an urban edge to the design. Staff can choose to sit at a traditional table or move to the breakout space which features relaxing, retro-style leather armchairs. For anyone wanting to enjoy spectacular views of the city, they can sit right up against the windows to work in swathes of natural light. Just as our homes are increasingly incorporating the kitchen into the wider living space, the same can be said of many UK offices. 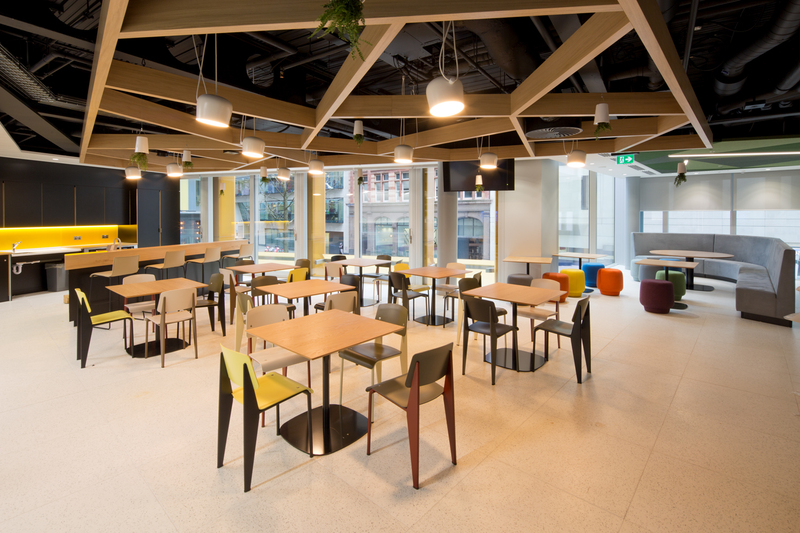 At Vodafone, we fitted a kitchen into the breakout space adjoining the traditional work area. It means staff have the convenience of refreshments close-at-hand whilst working, and doubles as a touch-down space for quick meetings. This statement wooden kitchen creates a feel-good design by bringing nature and biophilic elements into the office. 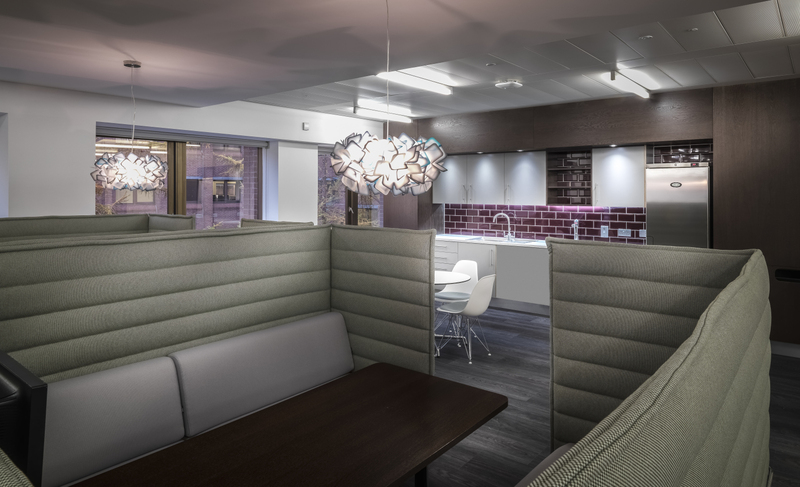 The kitchen dining space at Network Rail’s new Glasgow office has a relaxed vibe with a muted colour palette, soft lighting and a plum coloured tile splashback. Even the lighting gives this kitchen a dreamy feel, with cloud-effect pendant lights. Colleagues can pull up a chair and take a minute to relax with a cuppa or make use of one of the padded meeting booths, designed to reduce acoustic disruption in this communal space. CommBank has taken the concept of wellbeing and turned it onto the ceiling! A feature part of this kitchen-come-breakout space is the hanging wooden ceiling. This adds extra height to the space and keeps the area fresh with the light timber contrasting nicely against the black exposed services. The floor-to-ceiling windows let in ample natural and ensures the black cabinetry doesn’t overpower. The kitchen itself is a living reflection of CommBank’s brand colours with the black cabinets and bright yellow splashback providing a mix of vibrancy and sophistication. They say the kitchen is the heart of the home, and the same is true of at The Manchester Growth Company. Collaboration is key for staff working here, so having a communal kitchen space at the heart of the office is a great way to promote interaction and collaboration. 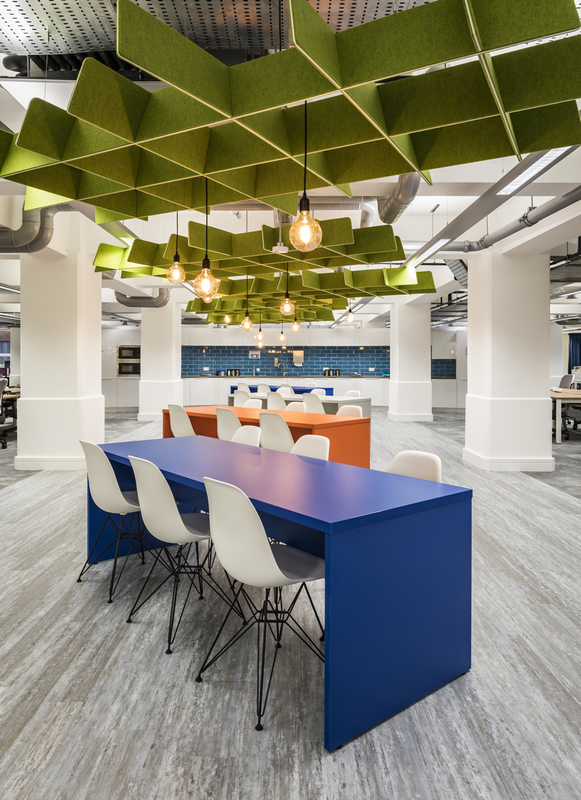 For colleagues wanting to continue discussions, we added colourful meeting tables with ceiling rafts above, helping to absorb acoustics from this busy part of the office.